Created in 1935 in Havana by Menendez Garcia y Cia., Montecristo is a mainstay of the Cuban cigar portfolio. From the diminutive and ubiquitous Montecristo No. 4 to the stately and shapely Montecristo No. 2 (a former Cigar Aficionado Cigar of the Year), Montecristos have a wide variety of sizes and flavor profiles. The current Montecristo band is brown with squiggly gold lines and white borders. The signature piece in the design, however, is the gold fleur-de-lis placed at the center of the band. 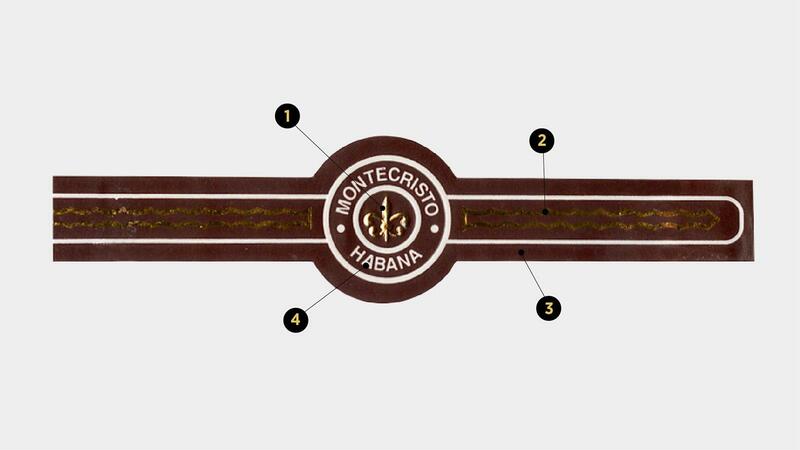 The band will always say “Montecristo” at the top with “Habana” beneath, separated by two white dots on either side. The fleur-de-lis, which is central to the band's design, has been embossed in gold since 2013. Run your finger over the band to feel if the logo is raised. If the fleur-de-lis is flat, the band is not authentic. The squiggly gold lines that run along the center of the band should be the same color as the fleur-de-lis, however, the lines are not raised. The color of the band also changed slightly in 2007. The brown band is now darker and redder, more of a bean color than the previous milk chocolate shade. The band is glossy, while some fakes might be closer to the pre-2007, matte-green color. The white circles, along with the two dots and borders that run outside the band’s gilded lines, should be embossed and have a consistent, stark-white color. Also, note the precision of the circles and lines. If they are uneven, faded or oddly shaped, you might have a fake on your hands.